I'm not sure that it's entirely accurate, but it's funny. That comic touches on my one question about some atheists... why do they feel compelled to share their lack of beliefs with others? It seems to be more of a blank religion at that point than the absence of beliefs. So what would the agnostic version of that cartoon be? "We're not sure if it's blank or not. We just know that there's no way to tell if it's truly blank or just written in invisible ink." Knumb: I find your perspective a little odd. When was the last time evangelical atheists appeared on your doorstep? I think the comic is amusing at least in part because it would be so out of character for atheists to bother their neighbors in this manner. Andy, I hadn't thought about agnostic door-to-door. Maybe print they can't be read? John and Drek, you raise an interesting issue. 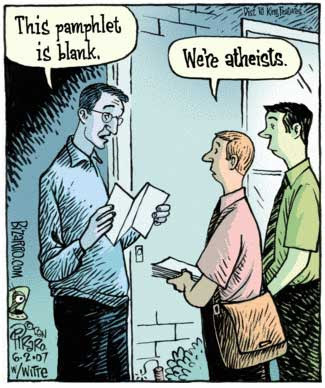 Certainly atheists don't go door-to-door, which makes the cartoon funny, but there are versions of what might be called atheist-evangelism. How does that fit with an atheist worldview? About the same time evangelicals have... never. I answered your question, so why do you feel compelled as an atheist to advocate your lack of beliefs? 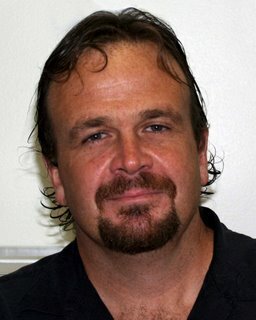 Brad: I can't say how the "atheist evangelism" fits in with an atheistic worldview in general. Personally, I don't think it's appropriate to evangelize but, given the rather prevalent and negative stereotypes of atheists, I think we do need to work a little harder to let people know that we're not amoral egotists. No more so than a lot of other groups, anyway. Knumb: I'm sorry, was I advocating my beliefs? I talk about them for the same reason many other people do- I feel strongly about them and consider them to be useful. That said, I have no particular interest in convincing you to believe as I do. That's helpful... wanting to correct perceived misrepresentations is a strong motivation. I think that's part of why I blog too. My opinion is that the true atheist is a spiritual nihilist, to the point that his or her own opinion renders itself moot in a logical loop. God does not exist, so what people believe does not matter, including the atheist. "A true atheist is one who is willing to face the full consequences of what it means to say there is no God. "To say there is not God means among other things that there are no Absolute Standards. For instance, an atheist may believe with all his heart that murder is wrong, but if he runs into somebody else who believes with all his heart that murder isn't wrong as long as you can get away with it, there is no Absolute Standard by which it can be shown that one view is better than the other, just as there is no Absolute Standard by which it can be shown that vanilla is better than chocolate. "If an atheist says that murder is wrong because it works against the good of society in general then he is saying that the good of society in general is gooder than the good of the murderer in particular, and that having thrown out all Absolute Standards, he can't say that. All he can say is that vanilla is better than chocolate because he likes it better and so do most of his friends. "If he says, 'In the absence of Absolute Standards, I declare that the murder is wrong in the name of common sense,' then he has simply made common sense his Absolute Standard. What is accord with common sense is Right and what isn't is Wrong. "What is American is Right and what is un-American is Wrong. What is ethical is Right and what is unethical is Wrong. What works is Right and what doesn't work is Wrong. These all bring God back under different names, i.e. Nationalism, Ethics, Pragmatism. To be a true atheist is to acknowledge no rule except the rule of thumb. "Thus many an atheist is a believer without knowing it just as many a believer is an atheist without knowing it. You can sincerely believe there is no God and live as though there is. You can sincerely believe there is a God and live as though there isn't. So it goes. "Lots of the time atheism isn't bad fun. I do what seems right to me and you do what seems right to you and if we come into conflict with each other, society has human judges to invoke human laws and arbitrate between us. Who needs a Divine Judge and a Cosmic Law? We can learn to live in lower case. "Except sometimes. Sometimes it's almost as hard to believe God doesn't exist as to believe he does. I don't mean a baby's smile, which is probably gas. I don't mean the beauty of nature, which is always soon followed by the indifferent cruelty and ugliness of nature. I mean an atheist is about as likely as anybody else to walk into a newsstand someday and pick up a copy of the 'National Enquirer' or some such. On the front page is a picture of a dead child. The bare back is covered with welts. The eyes are swollen shut. Both arms are broken. The full story is on page 3 if you have the stomach for it. "To be consistent with his creed, an atheist can say no more than to beat a child to death is wrong with a small 'w.' Wrong because it is cruel, ugly, inhuman, pointless, illegal, and makes the gorge rise. But what is apt to rise along with the gorge is the suspicion that it is wrong also with a capital 'W'--the suspicion that the law that has been broken here is not just a human law but a law as immutable as the law of gravity, one by which even if there were no children in the universe and no men to beat them, it would be written into the very fabric of reality itself that such an act is wrong. "The atheist holds the tabloid in his hand and asks the question Why should such things happen? Atheism can reply only, Why shouldn't such things happen? But he keeps asking." There's a bit more to the passage, but that's the gist of it for me. I don't think I've ever met a true atheist. I've met a lot of power-agnostics, a couple of nihilists, and a plenty of Christians and Jews who actually just worshiped money. If I were walking down the street and I saw a true atheist walking toward me, if there were some way to know, I would be scared. Those who claim atheism without truly rising to its standards are not scary, to put it lightly. I think I count as a "true atheist" by that definition. You're basically saying that in order to be "true atheist" one must be a moral non-cognitivist, which I am. Of course, omnibenevolent theism doesn't solve the problems with moral absolutism: you're still left with the question of whether God is good because he conforms to some external standard of god, or whether good is so because God says it is.